One of my Christmas presents was Ina Gartens new cookbook Back to Basics. I have all of Ina's cookbooks, but I think this one may become my favorite of hers. I love basic. I love easy. This book is filled with basic, easy, quick recipes that will make it look like you spent all day in the kitchen. I already have the recipes I want to make marked with post-its. There's lots of post-its. Lots. 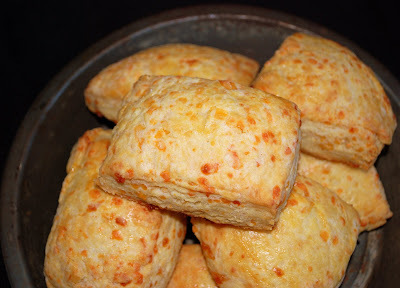 Since I'm off this week I thought it would be a nice treat to make buttermilk cheddar biscuits for the men for breakfast. After a brief warm spell the weather here is cold and windy again. Tomorrow we are expecting some snow. I've got all my recipes in order and all my ingredients ready so I can spend all day in the kitchen with the oven crankin' away. One other great thing about this recipe is it can be made the night before and kept in the fridge, so all you have to do in the morning is brush them with egg, throw on some sea salt and pop them in the oven....and that's just what I did. Remember to keep everything cold when your making any kind of biscuits....that's where the flaky part comes in. We each had one biscuit (with butter of course) this morning and it filled us right up. These would be great as a main course with a nice salad or a big bowl of soup or chili. 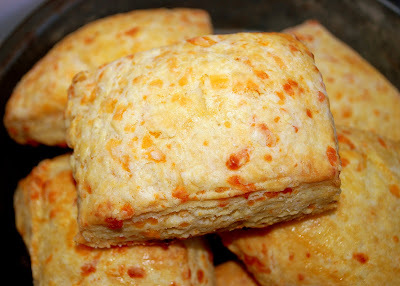 Delicious hearty biscuits for a cold and blustery day. Preheat the oven to 425. Place 2 cups of flour, the baking powder and salt in the bowl of an electric mixer fitted with a paddle attachment. With the mixer on low, add the butter and mix until the butter is the size of peas. Combine the buttermilk and egg in a small glass measuring cup and beat lightly with a fork. With the mixer still on low, quickly add the buttermilk mixture to the flour mixture and mix only until moistened. In a small bowl, mix the cheddar with a small handful of flour and, with the mixer still on low, add the cheese to the dough. Mix only until roughly combined. Dump onto a well floured board and knead lightly about six times. Roll the dough out into a rectangle 5 x 10 inches. With a sharp floured knife, cut the dough lengthwise in half and then across in quarters, making 8 rough rectangles. Transfer to a baking sheet lined with parchment paper. Brush the tops with the egg wash, sprinkle with sea salt, and bake for 20 to 25 minutes, until the tops are browned and the biscuits are cooked through. Serve hot or warm. This would be perfect with my Prime Rib on New Year's Day! Yum. I wanted that cook book but I guess Santa forgot!!! Wow these look great! I love to eat biscuits from the oven with lots of butter! This looks like a great recipes, especially since I think it's like those addictive biscuits they serve at the Red Lobster.....or the Dead Lobster as we call it around here.